UKSA was victorious in the Cowes Week Cardboard Boat Race, but more than that it was a story of one young lad’s personal journey. Dylan worked as part of a small team designing and building two boats during sessions of the YES (Youth Engagement for Schools) Programme but it’s fair to say he wasn’t the most engaged of team members. 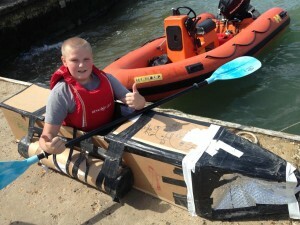 Yet his was the best boat of the competition, he won his two races and impressed the team at UKSA with the amazing positive attitude he developed and the encouragement he gave to younger participants on the day. Lee Jones, UKSA’s Youth Development Co-ordinator, explained: “Some of the boats looked amazing, a force to be reckoned with. Ours didn’t look that impressive in comparison but eventually they were the only ones that were still floating. There was a massive crowd there and the event was so funny, it was brilliant. “Dylan won and I was so pleased for him. He had lost a great deal of motivation over the past few months for several reasons, but out of the four young people on his programme he was the one who turned up on the day and wanted to see it through to the end. Second place went to Paige and Mia, also in a UKSA boat.